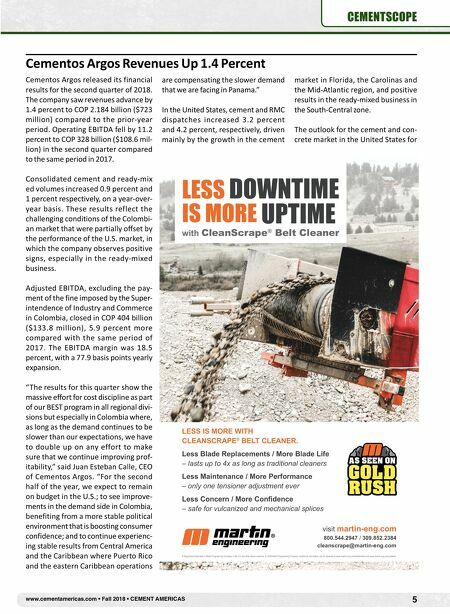 4 CEMENT AMERICAS • Fall 2018 • www.cementamericas.com CEMENTSCOPE Lehigh Hanson Announces Modernization Project for Indiana Plant Lehigh Hanson Inc. announced plans for modernization and expansion of its Lehigh Cement Co. plant in Mitchell, Ind. The company will invest more than $600 million in the plant modernization project, which will increase production capacity while also significantly reducing energy usage and emissions per ton of cement produced. 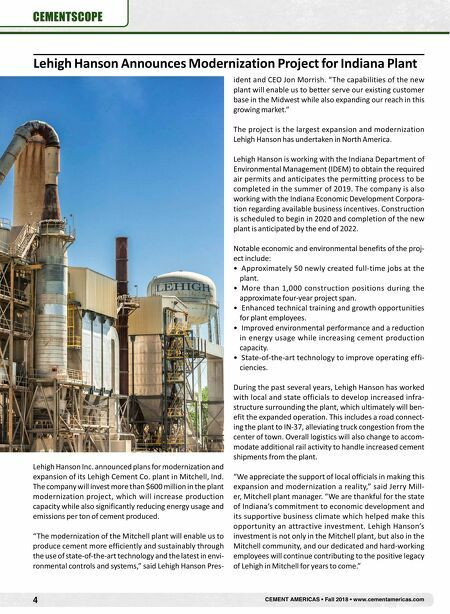 "The modernization of the Mitchell plant will enable us to produce cement more efficiently and sustainably through the use of state-of-the-art technology and the latest in envi- ronmental controls and systems," said Lehigh Hanson Pres- ident and CEO Jon Morrish. "The capabilities of the new plant will enable us to better serve our existing customer base in the Midwest while also expanding our reach in this growing market." The project is the largest expansion and modernization Lehigh Hanson has undertaken in North America. Lehigh Hanson is working with the Indiana Department of Environmental Management (IDEM) to obtain the required air permits and anticipates the permitting process to be completed in the summer of 2019. The company is also working with the Indiana Economic Development Corpora- tion regarding available business incentives. Construction is scheduled to begin in 2020 and completion of the new plant is anticipated by the end of 2022. Notable economic and environmental benefits of the proj- ect include: • Approximately 50 newly created full-time jobs at the plant. • More than 1,000 construction positions during the approximate four-year project span. • Enhanced technical training and growth opportunities for plant employees. • Improved environmental performance and a reduction in energy usage while increasing cement production capacity. • State-of-the-art technology to improve operating effi- ciencies. During the past several years, Lehigh Hanson has worked with local and state officials to develop increased infra- structure surrounding the plant, which ultimately will ben- efit the expanded operation. This includes a road connect- ing the plant to IN-37, alleviating truck congestion from the center of town. Overall logistics will also change to accom- modate additional rail activity to handle increased cement shipments from the plant. "We appreciate the support of local officials in making this expansion and modernization a reality," said Jerry Mill- er, Mitchell plant manager. "We are thankful for the state of Indiana's commitment to economic development and its supportive business climate which helped make this opportunity an attractive investment. Lehigh Hanson's investment is not only in the Mitchell plant, but also in the Mitchell community, and our dedicated and hard-working employees will continue contributing to the positive legacy of Lehigh in Mitchell for years to come."